A beautiful story that wraps you in its heart. If you could sum up This Quiet Sky: A Novella in three words, what would they be? It's more than a story... it's an experience. This Quiet Sky has all the markings of a truly great tale. And yet even deeper than that, hearts beat in the very words of its pages. Prepare to fall in love: with Sarah, with Tucker, with the two of them together and with their blossoming courage. 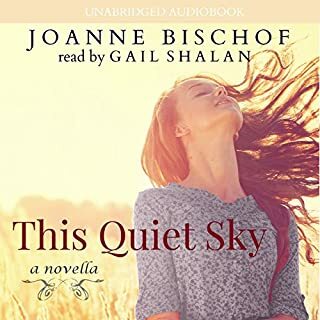 Joanne Bischof has constructed an experience that is the perfect balance of bravery, heart, tenderness and spark. In her trademark way she takes gentle, strong hold of a difficult set of circumstances and explores it in a way that is gilded with sincerity and rooted in love for her reader and her God. Love is not formulaic in life, and neither is it in This Quiet Sky. It is organic and true, taking us by the hand as Sarah and Tucker’s hearts are woven together to pull the strings of hope tight and far, even in the face of very serious illness. I walked away much richer for reading it. In fact, I didn't walk away at all. Tucker and Sarah have stayed with me, and always will. What about Gail Shalan’s performance did you like? As a new-to-me narrator, Gail impressed me so much with her careful handling of the story. From subtle accents, to the prosody and cadence of her voice, right down to the carefully-placed pauses and tempos, her performance was wonderful. It was evident that she'd spent much time creating the perfect audible personas for each character. Well done, Gail! The birthday party scene, and all that's at play beneath the surface there... just so bittersweet. It brought tears to my eyes. If you're thinking of giving this a listen, I highly recommend it!